Introduction: Stress has been associated with the exacerbation of asthma symptoms. Written emotional disclosure encourages people to write about their most stressful experiences facilitating cognitive and emotional processing. When conducted partly in a research laboratory, written emotional disclosure was found to yield a 12% increase in FEV1 percentage predicted in people with asthma. Given the link between stress and asthma, this trial was aimed at exploring the effectiveness of a 3-day written emotional disclosure intervention on lung function and quality of life for adults with asthma in a community setting. Methods: A randomised controlled trial was carried out on 138 adults with asthma aged between 18 and 45 years who were recruited through 32 general practices. Participants were randomly allocated to receive the emotional disclosure or the non-emotional control writing instructions. Participants completed the writing in their own home without researcher supervision for 20 minutes over three consecutive days. 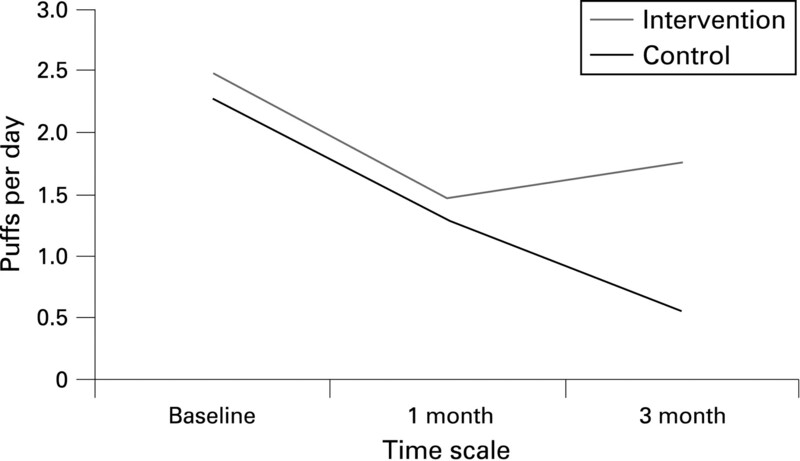 Assessments of lung function (FEV1 % predicted) using spirometry and questionnaires measuring quality of life, asthma symptoms, subjective asthma control and medication use were conducted at baseline, 1 and 3-month follow-up (see fig). Results: Baseline analysis showed a significantly higher proportion of smokers in the control condition but no differences in lung function. Controlling for smoking status, no significant findings for lung function, quality of life or asthma symptoms were found. At 3-month follow-up, participants in the intervention condition reported significantly better subjective control of their asthma (as defined by the asthma control test): odds ratio (OR) 3.01, 95% CL 1.30 to 6.94 and reported significantly better objective control of their asthma (defined as using their β-agonist less than once a day): OR 2.96, 95% CL 1.38 to 6.33 (see fig). Conclusions: Participants receiving the emotional disclosure intervention were more likely to demonstrate good control of their asthma both by self-report and a reduction in use of β-agonist. Although there was no effect of written emotional disclosure on lung function, this could be due to the observed reduction in β-agonist use. These reductions are in line with the National Heart, Lung and Blood Institute guidelines, which state that effective management of asthma should involve a reduction in β-agonist use. Abstract S36 Use of β-agonists for intervention and control participants at baseline, 1-month and 3-month follow-up. Introduction and Objectives: Current BTS guidelines recommend step-down of inhaled corticosteroids to the minimum dose required for the control of symptoms. However, this is rarely performed in a clinical setting, potentially resulting in over-treatment of many asthmatic patients. We performed a controlled community-based step-down with surrogate measures of airways inflammation. Methods: 119 patients with a diagnosis of persistent asthma underwent progressive step-down of therapy until they were on 200 μg BDP or equivalent per day or became clinically unstable. Once unstable, participants stepped back up to the last stable dose of inhaled corticosteroids (to determine the “lowest dose required for stability”). Exhaled tidal nitric oxide and mannitol challenge were recorded at the start and end of step-down as surrogates of airways inflammation. Clinical stability was assessed using AQLQ and spirometry. Results: The mean (SEM) dose of BDP or equivalent was significantly higher pre step-down than post step-down: 636.0 (35.7) versus 357.2 (18.9) μg/day (p<0.001). Mannitol PD10 was higher after step-down by 0.46 doubling dilutions (95% CI 0.02 to 0.89; p = 0.04). For nitric oxide the geo mean fold difference was 0.96 (0.87 to 1.06; p = 0.43). The mean (SEM) FEV1 (% predicted) pre and post step-down were 86.2 (1.51) versus 84.5 (1.46), p = 0.041. There was no significant difference in FVC or PEF pre versus post step-down. The mini AQLQ scores pre and post step-down were 81.60 (1.50) versus 87.40 (1.38), ie, a mean improvement of 5.80 (95% CI 3.85 to 7.75; p<0.001). Individual domains also showed significant improvements. Conclusions: We have demonstrated a significant reduction in inhaled corticosteroid dose with a paradoxical improvement in bronchial hyperreactivity. This was observed with no significant change in nitric oxide, and a corresponding improvement in quality of life. This apparent disconnect between reduction in anti-inflammatory therapy and improvement in measured inflammation may reflect enhanced compliance through frequent supervision. Introduction and Objectives: There are few non-invasive measures of small airways. The contribution of the alveolar compartment to exhaled nitric oxide (CANO) can be calculated as a surrogate of distal inflammation. Impulse oscillometry (IOS) is used to derive values for peripheral airways resistance (R5) and respiratory impedance (Z5). We assessed healthy volunteers, mild-to-moderate asthmatic patients, severe asthmatic patients and chronic obstructive pulmonary disease (COPD) patients with these techniques. Methods: 24 healthy volunteers, 21 severe asthmatics, 15 mild-to-moderates and 24 COPD patients were assessed with spirometry, impulse oscillometry and fractionated exhaled nitric oxide. Results: Mean FEV1 (% predicted) for healthy volunteers, mild-to-moderate asthmatics, severe asthmatics and COPD patients were 104%, 90%, 70% and 56%, respectively. CANO (mean ± SEM) ppb was elevated in severe asthma (3.8 ± 1.2) compared with mild asthma (1.9 ± 1.3, p<0.05) and healthy volunteers (1.4 ± 1.0, p<0.001), but were no different from COPD (4.4 ± 1.1, p = 1.00). CANO was higher in COPD than mild asthma (p<0.005) and healthy volunteers (p<0.001). Tidal nitric oxide (FENO) was higher in severe and mild-to-moderate asthmatics compared with healthy volunteers (30.0 ± 1.2 and 21.0 ± 1.2 vs 11.0 ± 1.1, respectively), but was not different between asthmatic groups (p = 0.66). COPD was not different from healthy volunteers or mild-to-moderate asthmatics (16.6 ± 1.1; p = 0.19 and p = 1.00, respectively) and lower than severe asthmatics (p = 0.02). In healthy volunteers R5 and Z5 were 0.37 ± 0.01 and 0.39 ± 0.01, respectively. R5 was increased in COPD (0.59 ± 0.04, p<0.001), severe asthma (0.55 ± 0.04, p<0.001) and mild asthma (0.52 ± 0.04, p = 0.03). X5 was increased in COPD (0.66 ± 0.05, p<0.001), severe asthma (0.60 ± 0.04, p = 0.001) and mild asthma (0.56 ± 0.05, p = 0.03). 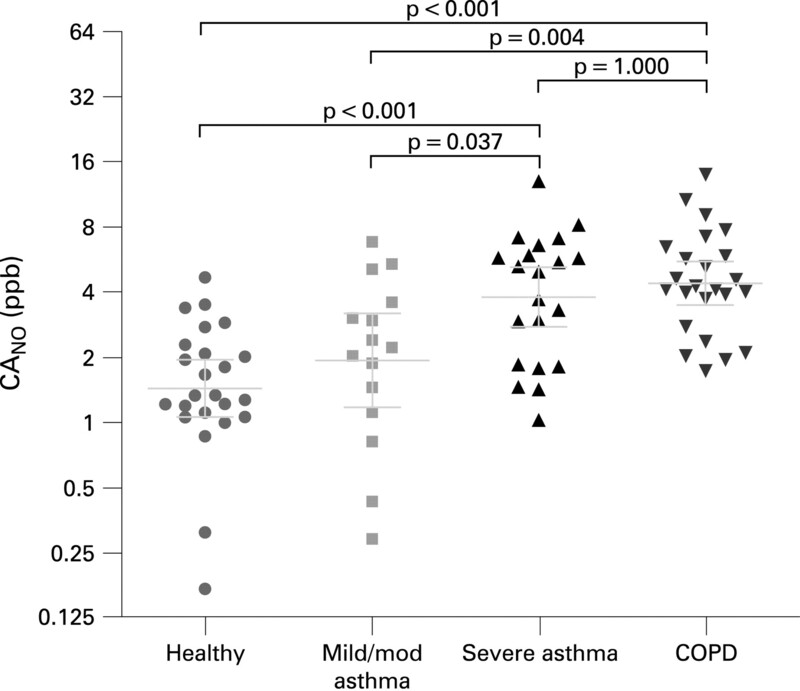 R5 and X5 were not significantly different between asthma severity and COPD (see fig). Conclusions: Measurement of CANO allows detection of small airways inflammation and provides additional information to traditional measures of spirometry and tidal nitric oxide. Moreover, in COPD there is small airways inflammation, similar to that seen in severe asthmatic patients. Our data support the view that different severities of asthma are related to inflammation at different sites. The role of IOS is not established. Abstract S38 Figure Alveolar nitric oxide. Data presented with geometric means and 95% confidence intervals. Introduction: Exercise-induced bronchoconstriction (EIB) is an acute, transient airway narrowing that occurs during or after exercise. In elite athletes, EIB has a reported prevalence of 11–50% depending on participation in endurance and/or winter sports. The prevalence of asthma and EIB among professional rugby players has not been formally investigated. Objectives: To measure the prevalence of EIB and asthma in a cohort of professional rugby players and to demonstrate the utility of a sport-specific field test as a screening tool in field sport. Methods: All players of a senior international rugby squad attending preseason training camp completed an airflow obstruction questionnaire. Each player performed a rugby-specific, exercise challenge, and had pre and post-exercise spirometry. Peak heart rate levels, perceived exertion and serum lactate levels (1 minute post-exercise) were measured to assess exercise intensity. A fall in forced expiratory volume in one second (FEV1) of 10% or greater from baseline after exercise challenge was considered diagnostic of EIB. Data were compared with national EIB and asthma data. During analysis, players were divided into two groups: those with airflow obstruction (AO) and those without (NAO). Results: Forty-two players were tested. The table summarises the spirometric results. Twelve players (29%) had a history of, or were diagnosed with, airflow obstruction (AO group). Seven had a previous diagnosis of asthma and were on inhaled treatment. Five players (12%) were newly diagnosed with EIB. Among the seven players with a previous diagnosis of asthma, 57% (n = 4) had EIB after exercise despite regular inhaled therapy. Comparison with the NAO group revealed no significant differences in anthropometry and exercise effort. Cough after exercise was reported in 58% of the AO group versus 20% of the NAO group (p = 0.01) and wheeze in 42% versus 7% (p<0.01), respectively. A trend towards increased prevalence of AO was noted in backs (42%) versus forwards (17%) (p = 0.07). Conclusions: EIB is more prevalent in professional rugby players than in the general population and a pre-existing diagnosis of asthma with regular inhaled therapy does not preclude EIB. Cough and wheeze after exercise were specific symptoms for EIB. Sports-specific field testing is a useful method of screening for EIB in professional rugby players. Introduction: Severe asthma services are phenotyping patients with a view to managing therapy more appropriately. Included in these phenotyping strategies are induced sputum analyses of airway inflammation and routine HRCT scanning of referred patients. Objectives: To analyse retrospectively whether there is an association between inflammatory cells identified in sputum and specific features diagnosed on computed tomography (CT) scans of patients within the Manchester severe asthma service. Method: Data from the first 155 patients to have sputum analysis attempted within the service (target population) was used in retrospect to document the frequency of eosinophils of 2.5% or greater and neutrophils of 60% of greater. CT scans of the target population that had been subjectively reported and documented in patients’ medical records were examined for mention of airway abnormalities related to asthma. Cell-positive and cell-negative sputum was compared with specific HRCT features. An intravalidation study of one radiologist involved in the scan reporting was carried out in order to confirm the consistency of film reporting. Results: Those patients with eosinophilic sputum were more likely to have bronchial dilatation (40%) compared with those who had non-eosinophilic sputum (15%) (p = 0.004). The association was stronger with higher levels of eosinophils. Eosinophils 20% or greater showed 69% to have bronchial dilatation, compared with eosinophilic sputum 2.5–20% (24%) and non-eosinophilic sputum less than 2.5% (15%) (p<0.001). There were no other statistical relationships between cell patterns and radiological abnormalities, although borderline trends were found between gas trapping and eosinophilic sputum (p<0.08) and ground glass shadowing and non-eosinophilic sputum (p<0.07). The intravalidation study showed a high level of consistency (94%) between original scan reports and the re-reported scans. Conclusion: Despite the aggressive treatment of severe asthma patients, bronchial dilatation is more common in eosinophil-positive patients, particularly those with higher levels of eosinophils. This previously unidentified relationship may be caused by direct eosinophilic damage to the airways or by a co-factor causing both dilatation and persisting eosinophilia. Introduction and Objectives: There are no prospective randomised data looking at the effectiveness of medical polypectomy or factors influencing steroid response in nasal polyposis. Methods: In a double-blind parallel study, 60 patients were randomly assigned to receive 2 weeks of 25 mg once daily oral prednisolone or placebo, followed by 2 months of fluticasone nasal drops 400 μg bid reducing to fluticasone nasal spray 200 μg bid for 4 months. Baseline assessment included nasal lysine–aspirin challenge, bronchial methacholine challenge and serum for total IgE levels. The mini rhinoconjunctivitis quality of life questionnaire (mini RQLQ) (primary outcome), peak nasal inspiratory flow rate, 100 mm visual analogue anosmia scale, visual endoscopy grading and overnight urinary cortisol creatinine ratio were measured at baseline and after each treatment period. Aspirin sensitivity (positive nasal challenge or history), presence of asthma (symptoms or positive methacholine PC20) were incorporated in an overall mixed model analysis of variance as between-group factors and atopy (total IgE) as a covariate. Results: Treatment limbs were well matched for asthma, FEV1, aspirin sensitivity and total IgE (table). Participants receiving prednisolone showed an improvement (p<0.05) from baseline at each timepoint for all outcomes as compared to placebo. There was no evidence of adrenal suppression at the end of final treatment in either group. Neither aspirin sensitivity nor the presence of asthma had a significant impact on steroid responsiveness. Similarly, atopy did not significantly influence treatment efficacy. Conclusions: Neither aspirin sensitivity, atopy nor concomitant asthma influence responsiveness to steroid therapy. Medical polypectomy followed by maintenance intranasal steroid is a highly effective treatment for nasal polyposis.